Draft: 2015, Los Angeles Dodgers, 4th rd. Willie Shawn Lamont Calhoun…father, Willie Sr., is a corrections officer at San Quentin State Prison in California…was a participant in the 2019 Rangers Winter Caravan…graduated from Benecia (CA) High School…attended the University of Arizona before transferring to Yavapai (AZ) College…played one season for Yavapai College and led the Arizona Community College Athletic conference in hits (98), runs (83), homers (31), RBI (85), total bases (216), and OBP (.520). Saw action in 35 games/26 starts for Texas in his 2nd straight season with big league time, setting career highs in most categories…had 2 stints with the Rangers: 7/20-8/15 and 9/4-end of season…hit .192 (5-26) in 1st 8 G through 7/27 after he was called up on 7/20 when Nomar Mazara went on the DL…batted .326 (14-43) over final 14 G of 1st stint (optioned on 8/16 when Mazara was activated) to bring season BA to .275…went 3-for-30 in 13 G/8 GS in September…his 26 starts came in LF (25) and as DH (1)…had a .950 (2 E/40 TC) fielding pct. in LF…was 7-for-21 (.333) with RISP and batted .192 (15-78) in all other at-bats…went 3-for-9 as a pinchhitter, posting tie-breaking RBI single on 7/30 at ARI and 2-out RBI single on 9/19 vs. TB. Was acquired from the Dodgers at the trade deadline and made his major league debut in September...was 9-for-34 (.265) in his 1st major league action, starting 9 of the club's final 19 contests and appearing in 13 games overall…spent the majority of the season at Oklahoma City (AAA) in the Dodgers organization and also logged time at Round Rock following the trade…was named to the Pacific Coast League Postseason All-Star Team, along with spots on the Yahoo! Sports All-Minor League Team and Baseball America's Minor League All-Star Second Team. TEXAS // Did not join club following the conclusion of Round Rock's season, but had contract purchased on 9/12 while working out at the team facility in Arizona…appeared in team's first 5 games following promotion, including starts in 4 of 5… collected RBI in 1st ML PA on 9/12 vs. SEA off Marco Gonzales and then went 0-for-next-15…started each of the club's final 5 games, going 8-for-18 (.444) with a HR, 3 RBI, and BB…had 13 G/9 GS (8-LF, 1-DH) overall…1st ML HR on 9/27 vs. HOU (off Justin Verlander), also 1st career multi-hit game. MINORS // Combined to bat .300 (146-486) with 27 2B, 6 3B, 31 HR, and 93 RBI over 128 G with Round Rock and Oklahoma City…entered the season as the 9th-youngest player in the PCL…finished the season ranked among the PCL leaders in total bases (2nd, 278), extra-base hits (3rd, 64), home runs (T4th, 31), and RBI (5th, 93)…was the 9th-toughest batter to strikeout in the PCL, averaging a strikeout every 8.0 at-bats… reached base safely in 107 of 128 games played…batted .298/.357/.574/.931 over 99 games with Oklahoma City prior to the trade…hit .268/.311/.495/.806 in 25 games with Round Rock in August, his only full month with a sub-.285 average… had multiple hits in each of his final 4 games with the Express, going 9-for-16 (.563) with 2 HR and 10 RBI. Selected as Texas League mid- and post-season AllStar at Tulsa (AA)...led the league in RBI (88) and total bases (236), and ranked among the league leaders in homers (2nd, 27), extra-base hits (T3rd, 53) and hits (9th, 128)...participated in the Sirius XM All-Star Futures Game and was also named an MiLB.com Organizational All-Star…honored as Texas League Player of the Week twice in the periods ending 5/29 and 6/12... batted .255 with a double, a homer and 6 RBI for the Glendale Desert Dogs in the Arizona Fall League…selected to the league's Rising Stars Game and was honored as the game's MVP after going 3-for-3 with a homer and 3 RBI. Posted a .316/.390/.519 slash line with 23 doubles, 11 HR and 48 RBI in a combined 73 games with Ogden (S-A), Great Lakes (A), and Rancho Cucamonga (A+) in his first professional season...named a Pioneer League mid-season All-Star with the Ogden Raptors. 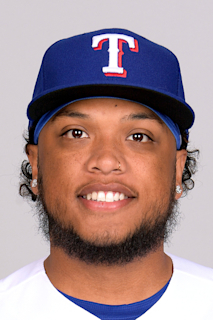 March 22, 2019 Texas Rangers optioned LF Willie Calhoun to Nashville Sounds. September 4, 2018 Texas Rangers recalled LF Willie Calhoun from Round Rock Express. August 16, 2018 Texas Rangers optioned LF Willie Calhoun to Round Rock Express. July 20, 2018 Texas Rangers recalled Willie Calhoun from Round Rock Express. March 13, 2018 Texas Rangers optioned LF Willie Calhoun to Round Rock Express. September 12, 2017 Texas Rangers selected the contract of LF Willie Calhoun from Round Rock Express. August 1, 2017 LF Willie Calhoun assigned to Round Rock Express. February 14, 2017 Los Angeles Dodgers invited non-roster 2B Willie Calhoun to spring training. September 16, 2016 2B Willie Calhoun assigned to Oklahoma City Dodgers from Tulsa Drillers. April 6, 2016 2B Willie Calhoun assigned to Tulsa Drillers from Rancho Cucamonga Quakes. March 12, 2016 2B Willie Calhoun assigned to Los Angeles Dodgers. August 18, 2015 2B Willie Calhoun assigned to Rancho Cucamonga Quakes from Great Lakes Loons. July 31, 2015 2B Willie Calhoun assigned to Great Lakes Loons from Ogden Raptors. June 17, 2015 2B Willie Calhoun assigned to Ogden Raptors. June 16, 2015 Los Angeles Dodgers signed 2B Willie Calhoun.